Universal design, the M5 Pro accepts most popular microphones from short to medium shotguns and facilitates quick microphone changes in the field. Unique, Clear GlideTM 3-stage isolation system virtually eliminates physically transmitted noise. 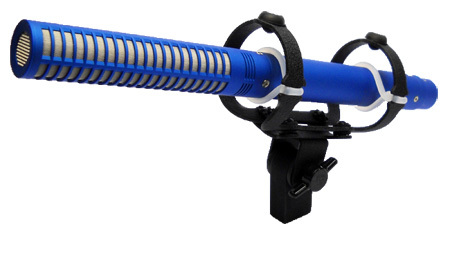 The M5 Pro can be swiveled 180 degrees, allowing for “flat to the pole” microphone positioning. PSC’s proprietary Clear GlideTM surgical grade silicone, microphone suspension rings bring new clarity to microphone suspensions. Dual, high density rubber, ceiling bumpers squelch extraneous dynamic reverberations. 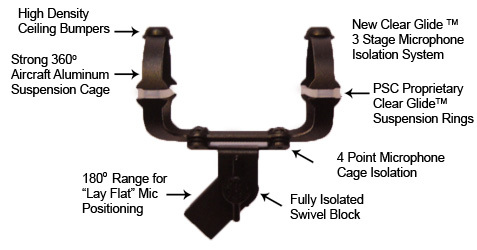 All of these features add up to the finest microphone suspension system available, at any price. The McDonald Mount has been in use world-wide since 1985. Professional Sound Corporation has been producing and distributing these mounts in cooperation with Randy McDonald since 1990. 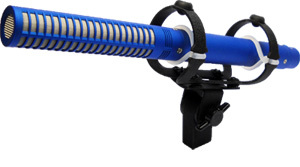 In late 2013 PSC’s Ron Meyer and Randy McDonald once again joined forces to provide you with the ultimate microphone shock mount. The New PSC M5 Pro shock mount with Clear Glide™ Technology builds upon the fundamental design principles of the original PSC/McDonald universal shock mount in use world-wide since 1985. It is made from robust, light weight aircraft aluminum and utilizes a unique clear glide three stage vibration isolation system to virtually eliminate the physical transmission of all unwanted low frequency rumble and handling noise. 3.650" x 2.250" x 4.000"